With our journey of visiting fifty-two churches over, I can reflect more on the complete experience. 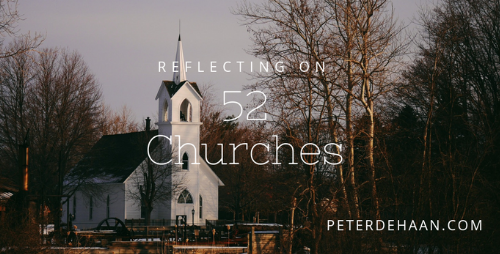 Today, I’ll add to my thoughts about Church #39. Many churches share food or a meal after their service, but this one put a new twist on it; we head off to a restaurant, en masse. Though not everyone goes, a significant number do, including my wife and me. As we form a line at a nearby fast food joint, one of their members passes out coupons to everyone. Though it’s great to spend time together outside of church, I wonder what kind of impact we make on the restaurant staff, with a bunch of church folk descending upon them, all bearing coupons and looking for a deal. Once we have our food and sit down, the people from church sit at tables all around us, but no one joins us or invites us to sit with them. Though they are all having a great time moving from one table to another and bantering back and forth, Candy and I are left out. We are all alone in a group of people. It’s not the first time, and it won’t be the last.